Visiten mi tienda en linea! Muchas gracias a todos!!! Esta imagen es semifinalista! Merci! Esta imagen con la misma pose ha sido pintada ya por muchos pintores desde el Renacimiento, yo solo quise hacer una version posmoderna pero siguiendo algunos lineamientos clasicos. Thanks to all!!! This image is semifinalist! Domo Arigato! This is my entry to WACOM contest Bring your vision ti life. I hope you like it and I am going to ask you all your cooperation to fav this image, to produce publicity and features in your journals. Thank you very much and let's see what happen.... I did it in Photoshop in very, very much time... Thanks! Every image, illustration or photo in my gallery are under my copyright and they cannot be used in any way unless you have my written permission (or the owners). They cannot be posted on other sites unless you have my written permission (or the owners). You cannot modify or use them as stock and you cannot sell them ! All rights reserved. No se permite copiar, usar, distribuir, vender o modificar ninguna de estas imagenes sin el permiso escrito adecuado. Good day sir.may I use this image for my father martial art logo sir? 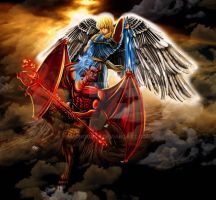 St. Michael's triumph over Satanas. Excellent archetypical imagery for triumphant goodness versus wickedness. I ran across this artwork and was blown away by it! I was wondering if I could use this artwork for a religious t-shirt. Genio a la diez mil potencia! Gracias a la 10 mil! Can I use this for a tattoo? I would prefer have the artist make sword a flaming sword also if acceptable. Hello! About the image, yes I can add the fire to the sword. After that, please send me a photo to link to your page and you please link to my page and credit me. However, I can not send you a big image, but the same size I have on deviant, is ok? está increíble man! no inventes! Gracias, tu trabajo tambien me ha encantado, es un honor. I absolutely love the colors and texture! Wow this is incredible! I am in awe of the wings, and the scale and Romanesque armor is wonderful as well. The demon's facial expression is perfect. The angel could perhaps be Michael. Was this your intent, or is he another angel? Awesome! The hair, brandished sword, and scales gave him away. Now this is how a fight between an angel and a devil always goes. Only in the realm of video games do demons stand a chance against true might. I like your comment! Thanks a lot! me encanto pero no le encontre sentido a la balanza de todas formas i loved! jajaja no es para tanto, pero gracias! Can you make this a wallpaper form? It looks really nice, but fuzzy when spread out.